The garden at the Peele Centre was built to commemorate all the officers of the Metropolitan Police who have died in service. The scheme is focused on the memorial stone and is a series of spaces providing a transition from the public ceremonial zone to an intimate place of reflection. The main path articulates the move from public to private and progressively fragments as it climbs across three terraces. On the top terrace the seemingly random placement of slabs encourages visitors to disperse and find a space to themselves for contemplation. The dominant processional axis is countered by two water rills which stretch across the width of the garden at 90° to the axis. Symbolic features have been introduced into the design; the line of white stem Birch represents 'the order and structure on which the Police Force is based', whilst the line of standing stones 'reinforce the idea of combined strength'. The water rill collects the fallen rose petals, and as the water circulates the petals gently move over a calm and reflective plane. The red petals represent the 'fragile nature of human life'. The Churchman scheme is typically restrained and uses a simple palette of Portland stone, gravel and timber decking/seating. A limited selection of grasses, bamboos, ferns, roses and Birch trees reinforces this approach. 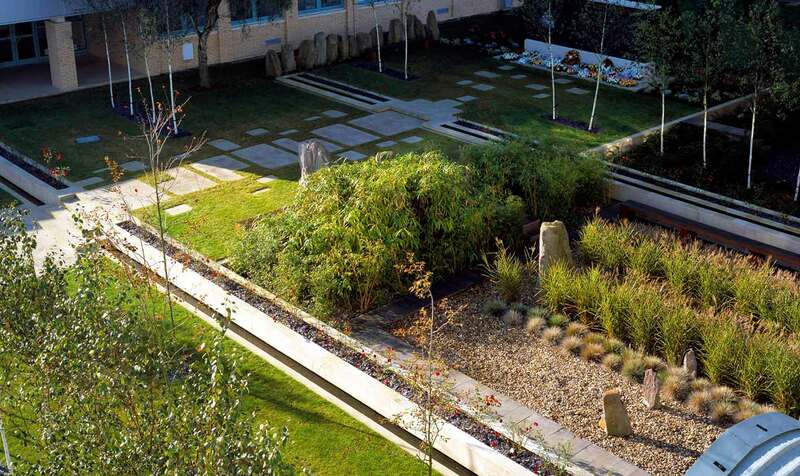 In 2002 the gardens were one of eight finalists in the 'Better Public Buildings' award and received the Prime Minister's Award for Calm.